This tool will test samples for differential expression using DESeq2 (version 1.6.3). Currently, the tool allows you to test a given factor (disease, for example) across two different factor levels (control versus Alzheimer's disease, for example). We will continue to develop this tool and will add new features (like allowing analysis over multiple factors) in the coming months. This step is optional. You can also use your default/existing group. What is a Database? A "Database" contains Tracks, Lists, Sample Sets, Samples, and Files. Make sure that you pick the proper reference sequence genome (hg19, for example) when creating your database. Note that we do not have an entry for hg38 or mm10 in our "Reference Sequence" list. If your data is associated with either of these reference sequence genomes, follow the directions below. In order to create a database associated with hg38 or mm10, select the "User Will Upload" option for "Reference Sequence"
If your genome of interest is not available, please contact William Thistlethwaite for help. The Fold Change Calculating Using DESeq2 tool accepts exactly two text files as input. One file should contain your miRNA read counts, with rows corresponding to miRNA identifiers and columns corresponding to individual sample names. The other file should contain your sample descriptors, with rows corresponding to individual sample names and columns corresponding to factor names ("condition", "biofluid", etc.). Drag exactly two text files (with the formatting described above) into the Input Data panel. You can also drag a folder or file entity list if it contains both text files. Drag a Database to the Output Targets panel to store results. Select Transcriptome » Differential Expression Analysis » Fold Change Calculating Using DESeq2 from the Toolset menu. Fill in the analysis name for your tool job. We recommend keeping a timestamp in your analysis name! Select the different ERCC-related submission settings if you are a member of the ERCC. If you are not, then ignore this section. Choose to upload your results to a remote storage area if you wish to do so. More information about this option can be found here. Download the results of your analysis from your Database. 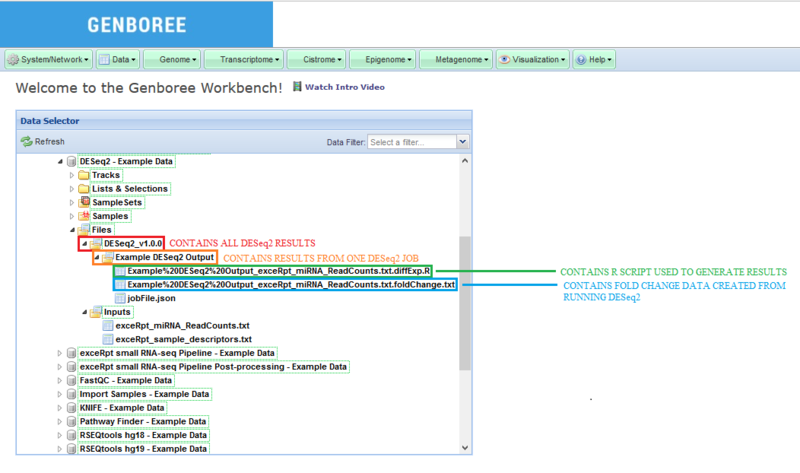 The results data will end up under the DESeq_v1.0.0 folder in the Files area of your output database. Open this sub-folder to see your results. Select any of the output files (explained in more detail below) and then click the link Click to Download File from the Details panel to download that output file. 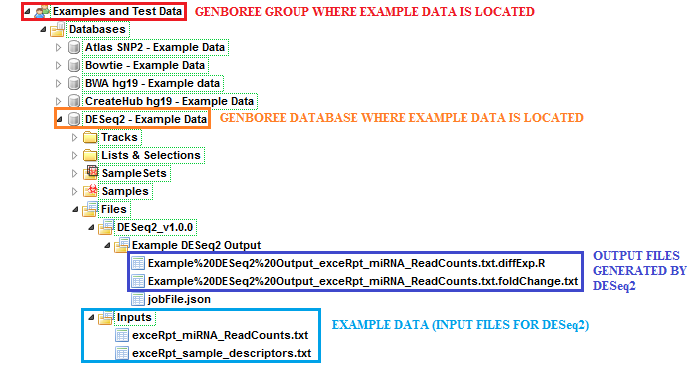 In this example, we have used a set of miRNA read counts processed by exceRpt for 181 different samples (found in exceRpt_miRNA_ReadCounts.txt). We have also used a sample descriptor document which contains information about disease and biofluid for each of the 181 samples (found in exceRpt_sample_descriptors.txt). 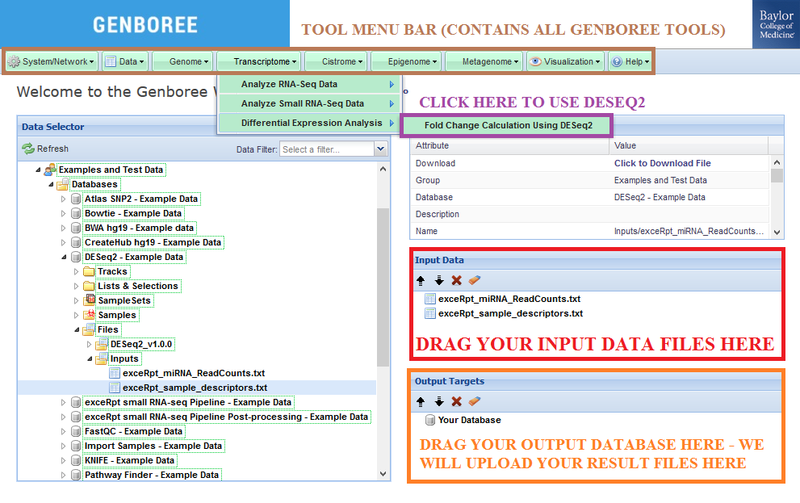 Under the group Examples and Test Data, select the database DESeq2 - Example Data. Both input files can be found in the folder: Files » Inputs. DESeq2 results can be found under the Files » DESeq2_v1.0.0 » Example DESeq2 Output folder in this database. A _foldChange.txt file that contains the results from your DESeq2 analysis. A _diffExp.R file that is the R script used to generate your results. Integrated into the Genboree Workbench by William Thistlethwaite and Sai Lakshmi Subramanian at the Bioinformatics Research Laboratory, Baylor College of Medicine, Houston, TX. This tool has been deployed in the context of the exRNA Communication Consortium (ERCC). Please contact William Thistlethwaite with questions or comments, or for help using it on your own data.